STEP has wonderful opportunities to get involved in community events in support of our mission. We have opportunities for event planning, event volunteering, in-kind donations, and sponsorships. Details on STEP’s Empty Bowls, STEP in Steel Toe, and the CP Holiday Train follow. 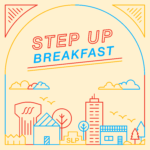 In 2019, STEP will hold the inaugural STEP Up Breakfast. Contact STEP for any questions or suggestions. ABOUT THE EVENT: STEP will host the inaugural breakfast gathering on May 2, 2019 at the Metropolitan Ballroom. Learn over breakfast about STEP’s programs that empower lives and inspire hope for our neighbors. Event is free to attend and breakfast is provided. Participants will be invited to donate to fuel STEP’s powerful programs. Attend: Reserve a spot online and show up on May 2. Table captains: If you would like to be a table host and invite your friends and colleagues to breakfast please contact STEP at 952-208-8769 or info@stepslp.org. Sponsors: Sponsorships available between the $500 and $10,000 levels. Details can be found on this form. Contact STEP at 952-208-8769 or info@stepslp.org with questions or if interested. 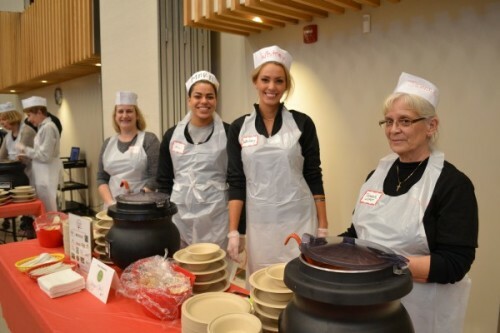 ABOUT THE EVENT: Since 2002, approximately 1,000 neighbors join for a simple meal of soup and bread provided by local businesses for lunch or dinner. The primary purpose of the event is to build awareness of food insecurity in our community. The event includes music entertainment and children’s activities. Participants receive a handmade pottery bowl to take home as a reminder of empty bowls in our community. A free-will donation benefits STEP programs. In 2020, Empty Bowls will be held Thursday, March 5 at Westwood Lutheran Church. Event planning committee: Meets weekly for 2-3 months to plan all facets of STEP’s largest event. Soup and bread donations: Local licensed establishments are invited to donate soup or bread. Donors will be acknowledged at the event. Sponsors: There is a long-standing chief sponsor of the event. Sponsorships at the $250 and $1,000 levels are welcome. Sponsors will be acknowledged before, during, and after the event. Contact info@stepslp.org if interested in committing in any way to Empty Bowls. ABOUT THE EVENT: Steel Toe Brewing hosts a fun and informal fundraiser for STEP in their back taproom. The evening event requires tickets to be purchased and includes beer samplers. Food trucks are also on hand. The event raises funds for STEP’s Homelessness Prevention Program. In 2019, STEP in Steel Toe will be held Wednesday, July 24 at Steel Toe Brewing. Attendees: Purchase a ticket and donate generously at the event to keep SLP families in their homes. Sponsors: There is a chief sponsor of the 2019 event. Contact info@stepslp.org if interested in committing in any way to STEP in Steel Toe. ABOUT THE EVENT: The mission of the CP Holiday Train is to combat food insecurity in local communities. 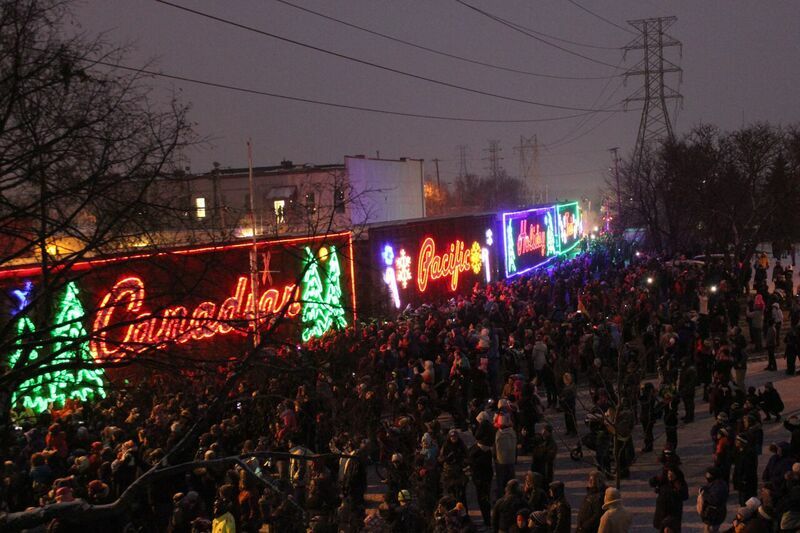 One thousand feet of 14 brightly decorated rail cars pulls into the community and stops in order to provide a pop-open concert from one of the cars. 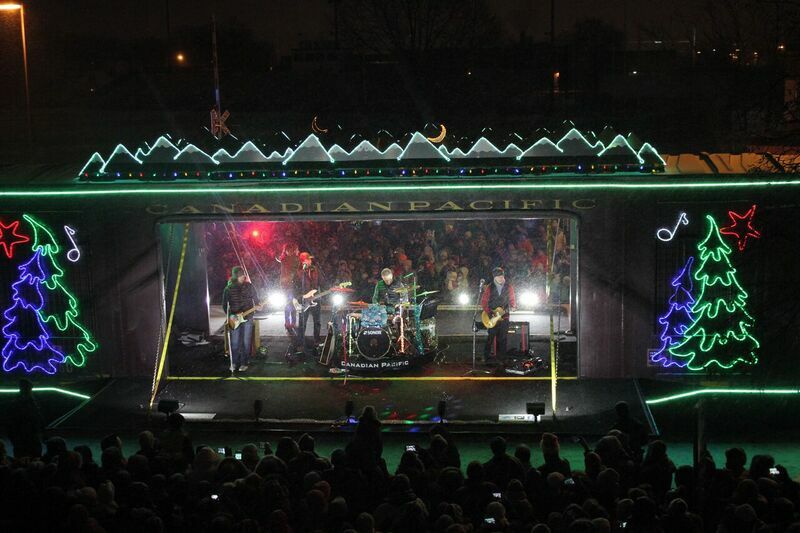 The Holiday Train has stopped three years in a row in St. Louis Park–right in front of STEP. Thousands of people from St. Louis Park and beyond came out on a cold day to see the spectacle of the train and participate in the pre-train festivities. Canadian Pacific is expected to determine the schedule of their stops in the fall. Sponsors: Sponsorship levels for the St. Louis Park stop and pre-train festivities range between $250 and $5,000. In-kind donations for the event (event supplies, etc) can count for up to 50% of the sponsorship level. Vendors: Businesses and nonprofits are invited to provide a service, product, or activity that would be a good fit for the event. Vendors would be charged a small fee or could be part of a sponsorship level. Volunteers: There will be need for day-of volunteers to collect food and financial donations, as well as helping to orient attendees. Contact info@stepslp.org if interested in committing in any way to the SLP Holiday Train stop.